To simplify its enrolment process and adapt to students’ growing mobile usage, Open Colleges Australia needed to overhaul its site design. With a simplified design and landing pages optimised for mobile, the brand boosted conversions along with leads and revenue from mobile devices. In today's digital world, classrooms aren't confined to campus anymore. From coffee shops and park benches to comfy bedrooms at home, students can conveniently pursue an education virtually anywhere. A leading online learning provider in Australia, Open Colleges Australia offers more than 150 vocational courses to students looking to enhance or change their careers. And in recent years, more students have been using mobile to consider their options: Between 2014 and 2016, the company saw a 47% increase in traffic from mobile devices. To adapt to its students' increasing reliance on mobile and ensure a seamless mobile user experience (UX), Open Colleges Australia needed to revamp its entire website. With a heavier investment in its mobile infrastructure and pages optimised for both students who prefer to fill out web forms and students who prefer to call, the company passed its (A/B) tests with flying colors. Pursuing an education is a major undertaking, so students' paths to enrolment are long and deliberate. Some students prefer to get all of their information on the web, while others like talking directly to school representatives. 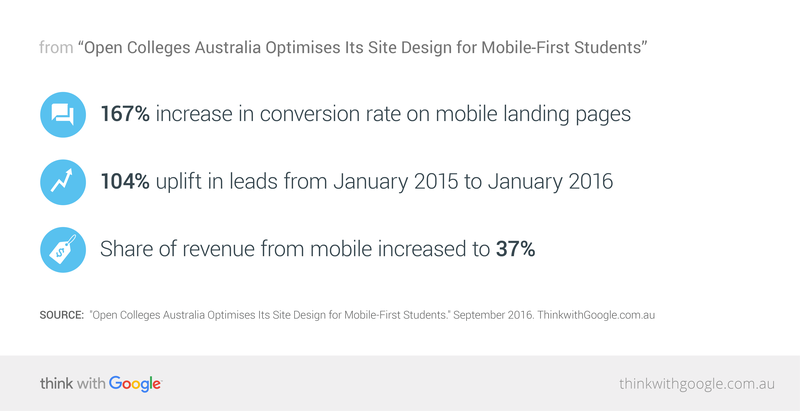 Open Colleges Australia looked to deliver relevant information and helpful CTAs on its mobile landing pages for all types of students at three key stages of the purchase funnel: awareness, consideration, and conversion. The company conducted dozens of A/B tests to determine which landing page designs affected phone and web conversion rates the most. The tests helped the team optimise placement of logos, key unique selling points (USPs), and bite-sized course descriptions. The team also figured out the best places to include floating, thumb-friendly links to course guides and click-to-call buttons. In the example shown above, Open Colleges Australia redesigned landing pages for students still in the awareness phase—and it led to a 20% lift in conversion rate. The new page featured key USPs and logos at the top, a convenient pre-populating lead form, and CTA buttons at the bottom that make it easier for students to contact Open Colleges Australia. The second example above shows the updated landing pages for students a bit further down the purchase funnel. The new conversion phase mobile landing pages—with no navigation bar, snapshot course descriptions above the fold, and floating CTA buttons—led to a 16% uplift in conversion rate. During the key pre-semester months of January and February in 2015, over 50% of all education-related queries were made on mobile devices.1 So Open Colleges Australia knew how important it was to offer students an inviting and hassle-free mobile UX. Along with a simpler, uncluttered homepage design, investing in enhanced back-end infrastructure led to a 27% increase in page speed. Instead of designing a separate mobile-optimised site, Open Colleges Australia went with a responsive website design for a seamless experience across every device. Along with a simpler, uncluttered homepage design, investing in enhanced back-end infrastructure led to a 27% increase in page speed. In a 2015 study conducted by SOASTA, a one-second page speed improvement on a leading online retailer’s mobile site correlated with a 27% increase in conversion rate. So by improving its own page speed, Open Colleges Australia could confidently predict a boost in conversions after the site’s redesign. The company's heavier investment in mobile led to key metrics boosts across the board. With a fresh, lean site design and mobile landing pages tested for success, Open Colleges Australia took a giant leap towards connecting aspiring students around the world with a brighter future. Even after generating such positive results, continuous A/B testing is slated to be a regular part of the brand's efforts to offer aspiring students the sleek and simple mobile UX they demand. 1 Google internal data, mobile and tablet, 2015, Australia.